New Delhi: Attempts by Pakistan to link the Mumbai terrorist attack of November 2008 to the earlier explosion on board the Samjhauta Express are likely to flounder in the face of the United Nations Security Council’s decision to sanction a key Lashkar-e-Taiba operative for his role in the 2007 train bombing. For the past year, Indian investigators, probing the deadly attack on the Lahore-bound train in which 68 people, mostly Pakistanis, were killed have been exploring various theories, including the involvement of the Lashkar. 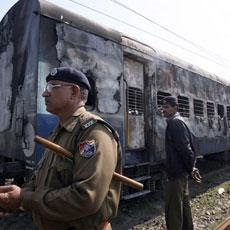 The unravelling of a Hindutva terrorist cell following investigations into the Malegaon bombings generated leads which also prompted some speculation about their possible role in the Samjhauta incident. Though the trail of evidence from Panipat and Indore eventually ran cold, external intelligence agencies — presumably from the United States — clearly had information the Indian side didn’t. And they seem to have found the fingerprints of the LeT and the Al-Qaeda all over the wrecked train. The U.N. citation of Qasmani and LeT spokesman Yahya Mujahid, which was followed on Thursday by a separate ban imposed on the duo by the U.S. Treasury Department, took Indian officials by surprise. Senior officials told The Hindu it was evident the U.S. had access to information that it had not yet shared with India. In the exchange of dossiers between India and Pakistan following the terrorist attack in Mumbai, Islamabad had sought to ‘balance’ the optics of being asked to act against the LeT by seeking details from New Delhi on the progress of investigations in the Samjhauta case. Very nice. Mr.Varadharajan , please visit Pakiterroristan.wordpress.com. I have added your blog as a link. It is also possible that the information has been shared but not used or was ignored because that will mean the spit-and-run smear campaign against BJP and Hindus in general would have to be stop and the 'liberal' media that has been generously attributing every terrorist incident to 'Hindutva' forces simply because someone got arrested somewhere, has to stop as well. I do congratulate you for bringing out this matter, though your intention has been to slam the US for not 'sharing'. Pakis will change the name for their terrorist group again and again , to get around the ban? What will India do to prevent that ? Thank you for shedding light on the Samjhota Express investigation. Ironically, I find little discussion in the English media about it. Perhaps, our secular media is tongue tied by the discovery and also feels at loss because of the countless hours that were spent on blaming the bogeymen - the scheming idol-worshippers and their silly Hindutva. Or, may be the investigation journalists found the death of Michael Jackson more scintillating than covering the news of terrorists behind Samjhota express. Like our intelligence officials, our journalists need an upgrade.